The Irish Warriors have out played the New Zealand Hawks to reach the grand final of the International Rules Cup 2011. A determined four quarter display saw the Irish prevail in a tough physical encounter. Ireland’s seemingly superior desire and work rate saw them dominate the contested possession and deny the Hawks time and space on the ball. The Hawks were unable to get their flowing passing game going as they found the Irish half back line continually repelling their advances. Michael Carey kicked all five of Ireland’s goals as the NZ back line had no answer for the forward who has been honing his skills at Sydney University. The television media took to the International Cup 2011 at the Royal Park ovals on Wednesday, after a slow build-up in media coverage over the past two weeks. IC11 was covered by several TV and radio news services, including Channels 9, 10 and 7, and by radio stations including 3AW and SBS Radio, which recorded a segment for its French program. The Victorian Premier, Ted Baillieu, with his ruckman build, tossed the coin for the match between the American Revolution and Papua New Guinea. Drawn by the political luminary, a battery of TV news cameras invaded the ground backed up by clusters of ‘suits’. AFL CEO Andrew Demetriou was also there for the big moment, a prelude to the unstoppable march of Papua New Guinea, as the footy team of one of the world’s poorest nations defeated the Revolution, the team of the world’s richest nation, the USA, by 9.14 (68) to 3.3 (21). Playing Great Britain was not something South Africa had figured on when they reviewed the IC11 draw. Their aim was always to return to the top four semi-finals, but after losing to the United States last Sunday at ANZ Stadium the Africans had to re-group to at least ensure they didn't slide too far. For the Bulldogs it was a chance to claim the scalp of one of the top group of countries. The Lions were looking strong coming onto the field, fast paced play with great kicking and marking skills slicing through the British Bulldogs midfield and defence for the opening goal. But the Bulldogs were pushing to move up the rankings as well and were giving it everything they had. Their initial possession play was surprisingly effective against the long-kicking Lions and they also got a few chances in the first quarter, but the Brits only managing to take back a behind out of the early South African lead. Finals draw for the 2011 AFL International Cup, as confirmed by the AFL at 9:40am AEST Thursday. We've updated our unofficial ladders to the end of Game Day 7 August 24th (above at time of writing). Division 1 men's does not change as they were playing finals. However it was the final minor round for Division 2 men's and for women's. By our calculations that puts Fiji and France into the Div 2 grand final and similarly Ireland and Canada in the women's. 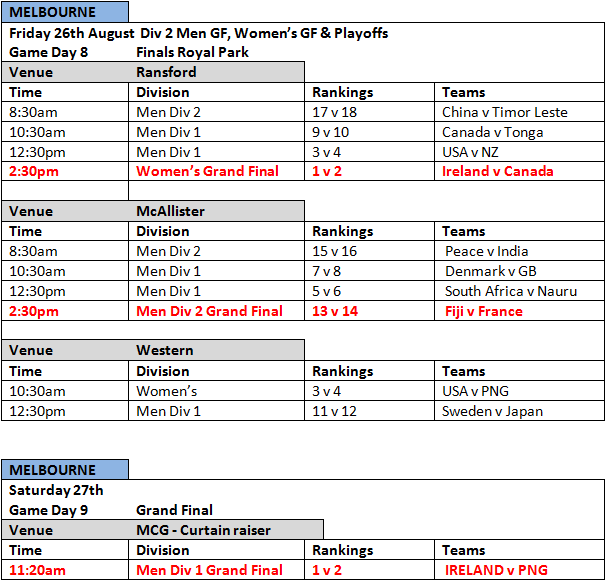 Of course in Division 1 the semi final winners were Ireland and PNG, through to the grand final at the MCG on Saturday. We'll publish the official final round draw when it is released. Derryn maintains his 2 game lead in our tipping competition. We're 55 games in now (was supposed to be 56 but Canada vs Japan was accidentally left out of the last round of tipping). And now the final round of matches to decide the 2011 WFN IC11 footy tipping champ. Please note that a margin (points) must be specified for every match with the smallest aggregate used to split a tie (we'll assume you tipped the worst result plus 10% for any you don't specify). For aggregates, tipping a team A by 10 points but team B wins by 20 points gives an aggregate of 30 points. A reminder that the top two spots receive a football courtesy of our great supporters Burley-Sekem. Players marked with * are WFN staff and ineligible for the prizes. The list has shrunk a small amount as those tipsters that signed up but never once submitted a tip have been removed. In the first semi final match of AFLIC11 Game Day 7 the reigning champions PNG took on the resurgent USA on Ransford Oval in Parkville. At stake the chance to play for this year’s championship on the MCG on Saturday. The two teams have only ever met once before in the preliminary final at IC05 and on that occasion PNG defeated the US by just one point. Since that time football has grown in both countries, but PNG growth has been based on junior development while the US growth has been a growth in senior numbers and a focus on sending better players to Australia to enhance their raw talent with solid Australian week in week out senior competition. A sunny Wednesday late winter afternoon in Melbourne, signs of spring and finals footy, and unofficially this match was a final. The US Freedom had to win to advance to the Women's final after their defeat at the hands of the Northern Lights the previous week. For Ireland the incentive was to keep their opponents down and finish the minor round undefeated. Naturally the US came out hard, determined to show the Irish who was the better team and having mostly played lower sides until then, the Banshees appeared to be taken by surprise. The Freedom duly got the opening goal they needed. After that the game was very tough as the Banshees tried to wrestle back control but the two teams were tied for intensity and matched for skill. The USA girls then got another chance from a free kick that was quickly relayed into the Banshees' defensive 50m, but it went through for a behind. To grab a grand final spot Canada's Northern Lights went into today's game against the Australian Indigenous Multicultural team needing a win to go ahead of the US in the Women's Division and then have the US lose to Ireland, else rely on an unlikely percentage outcome. Given the form of the Australian IM side in Sydney this should have been straight forward, but there was always a suspicion the Aussies would have some added depth available in Melbourne. Indeed they looked a totally different outfit when they came onto the field, and not just because they’d been bolstered by a few VWFL girls who hadn’t been in Sydney. They by far looked the more dangerous team at first, but after they’d finally conceded a behind, Canada's Northern Lights regained their confidence from last week’s win against the USA Freedom, and came back strong. They got the opening goal, and looked threatening for the rest of the quarter, but despite their many chances, they also came away with 5 behinds at quarter time. In the second quarter, the Australians slammed straight into the game, determined to show what a few extra players could do and got their first goal. Could they shock the North Americans and deny them a spot in the grand final? In the last match of AFLIC11 Game Day 7 the luckless Canadians took on the plucky Japanese. But today it would be good form rather than anything to do with luck that would see Canada home. McAlister Oval in Parkville was in very good condition for fast running football. Canada got the ball rolling in the first quarter through Heuberger. It was a tough battle in the first stanza and Japan used their low flat kicking style to good effect, but even so the Canadian backline was able to continually pick the ball off and send it forward again. After some hard work Kyle Graham eventually gave Canada their second, and 2008 World Team player Scott Fleming added a third on the siren to put Canada 19 points up. France saw off a comeback from the Peace Team to scrap a 6-point win today, 5.5 (35) to 4.5 (29), and confirmed their spot in the Division Two grand final of the 2011 AFL International Cup. The game started out as an arm wrestle, with both sides struggling to hit targets under pressure. France were doing all the attacking, but couldn’t convert until Gregoire Patacq kicked the first goal of the game. The Peace Team had chances, but couldn’t get on the board, decision making errors such as having a running shot on goal and putting it out on the full, instead of kicking to the man loose in the goalsquare. In the first match of AFL IC11 Game Day 7 the two winless teams looked to open their International Cup winning account. The Western Oval in Royal Park, Parkville, Melbourne was not looking the best surface after extensive drainage works were done here some weeks ago. But the weather was fine and warming up to burn off the dew and both sides were keen. Of course there could be only one winner and today India recorded their historic first ever victory in international Australian football.